Saving serves a crucial economic function; it helps fund productive investments that drive economic growth, and it generates returns on those investments that allow individuals to build wealth and finance future consumption. However, in many cases, the tax code penalizes saving and investment by subjecting it to multiple layers of taxation. A new study on tax rates on capital income presents the statutory tax rates on five types of capital income across 33 Organisation for Economic Co-operation and Development (OECD) member countries and analyzes the biases these taxes create at the individual level. 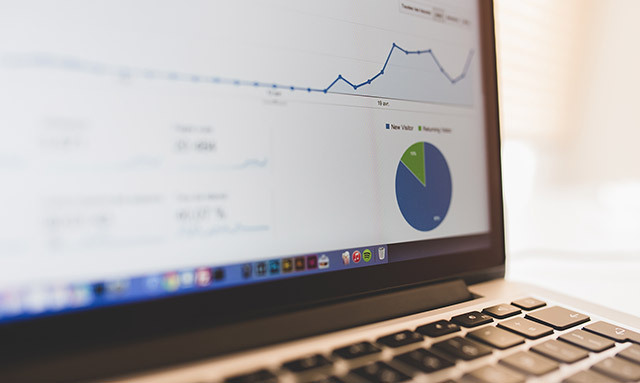 The study, by Michelle Harding and Melanie Marten of the OECD, reviews the top statutory rates applied to dividends, interest income, and capital gains as of July 1, 2016. Quite notably, the United States taxes four of the five categories at above-average rates, while a rate for the fifth category (capital gains on long-held property) was not included in comparisons because of the complex nature of the U.S. tax code in that particular area. Dividends are taxed first at the corporate level as company profits and then taxed again when distributed. Between 2012 and 2016, the average combined statutory rates on dividend income for countries in the study increased from 39.7 percent to 40.4 percent. Interest income is taxed at the individual level on interest received from bank accounts and corporate bonds. The average tax rate for interest on bank accounts is slightly lower than for interest on corporate bonds. Average tax rates for both categories increased slightly from 2012 to 2016 for countries in the study; bank accounts rose 1.5 percentage points to 27.1 percent and corporate bonds rose 1.2 percentage points to 28.2 percent. Capital gains income on shares is assumed to be derived from reinvested corporate profits that have been subjected to corporate level taxes, which reduce the amount of return to the shareholder. The study explains that in most countries, capital gains income is measured as the difference between the sale price of the asset and the asset’s acquisition cost. Tax treatment at the individual level can vary depending upon the length of time the share has been held, with shorter-held shares sometimes facing higher tax rates. From 2012 to 2016, average combined tax rates on long-held capital gains shares increased from 34.9 percent to 35.4 percent for countries in the study. * Mean for all countries (both countries where the tax treatment of short-held shares differs from the tax treatment of long-held share and those that treat both the same). ** Mean for countries that tax capital gains on real property, excluding the United States. After comparing the different rates applied to these types of capital income, the study analyzes biases these different tax treatments create. At the corporate level, bias occurs because the tax code typically allows businesses to deduct the cost of borrowing (interest payments) from corporate income, but not the cost of equity (dividend payments). This tax treatment distorts the choice between debt financing and equity financing, creating a favorable bias towards debt. The study shows similar results at the individual level as well: tax codes in 26 of the 33 countries in this study are more favorable towards debt than equity at the individual level (weighting the combined rates on dividends and capital gains equally). However, the relative differential in tax rates is lower than the statutory corporate tax rate, meaning the debt bias at the personal level is less than the debt bias at the corporate level. From 2012 to 2016, the overall debt bias declined from 8.9 percentage points to 8.2 percentage points; the debt bias in the United States decreased from 10.6 percentage points to 6.8 percentage points. This new study shows that capital income in the United States is taxed at relatively high rates that distort the saving and investment decisions made by businesses and individuals. Ideally, the tax code should be neutral across all types of economic activity, subjecting each dollar to just one layer of tax. The recently enacted Tax Cuts and Jobs Act included several provisions to lessen the bias against equity and reduce the burden on investment, such as limits on interest deductibility and full expensing, respectively. These changes should improve the competitiveness of the United States going forward, though there remains opportunity to reduce the tax bias against saving and investment. Kentucky’s current fiscal situation is dire. With one of the worst funded pension systems in the country and a budget that’s facing the possibility of severe cuts, legislators in the state are understandably having a difficult time juggling the state’s finances. The House budget plan has not yet been released, but details have emerged on the revenue raisers. To ease budget cuts, the House budget plan increases the cigarette tax from $0.60 to $1.10 and introduces a new tax on opioids at 25 cents per dosage on the wholesaler level. The plan also eliminates Kentucky’s $10 personal credit. There are a number of problems with this approach. First, excise taxes should not be used to overcome structural issues with the tax code that lead to an underfunding of basic core services. The cigarette tax in particular is an unstable source of revenue. Typically, when states increase their cigarette tax rates, it’s followed by a spike in revenue that later leads to a revenue decrease, sometimes even dipping to lower revenue levels than before the tax increase. We’ve illustrated this pattern for all 50 states in our cigarette revenue tool, and it holds true for Kentucky. The chart below shows inflation-adjusted cigarette tax revenue collections in Kentucky (you can compare other states using the full tool at the bottom of this page). When the state increased its cigarette tax rate in 2009 (rate increases are noted with vertical yellow bars), revenue jumped initially but declined significantly in following years. Basic services like education deserve to be funded by a revenue source more stable than excise taxes. Second, due to neighboring states with low cigarette tax rates, cross-border competition could be an issue for Kentucky at a rate of $1.10. Tennessee, Virginia, Indiana, and Missouri all levy rates lower than $1.10. The lower nearby rates would incentivize smokers to drive across the border to buy cheaper cigarettes – some, like those who would buy in Virginia where the tax rate is only $0.30 per pack, would see significant cost savings from a quick trip into a nearby state. This proposal underscores Kentucky’s desperate need for comprehensive tax reform. If the legislature decided to take on comprehensive tax reform, it would be options that balance revenue increases with pro-growth tax provisions. Kentucky’s tax code penalizes investment and is outdated and uncompetitive on both a regional and national scale. Its tax structure ranks just 33rd out of all 50 states on our State Business Tax Climate Index. Comprehensive tax reform is difficult, and Kentucky legislators have a lot on their plate this year. However, if they continue to try to bandage the problem instead of truly fixing the structural issues in Kentucky’s tax code, they’ll be struggling with the same revenue issues in future years. The legislature should think twice before increasing Kentuckians’ tax burdens without providing them the benefits that comprehensive, pro-growth tax reform would provide families in the state. Taxpayers reported $10.4 trillion of total income on their 2015 tax returns, a 4.5 percent increase from the previous year’s $9.9 trillion. Sixty-nine percent ($7.1 trillion) of total income reported on the 1040 consists of wages and salaries, and about 83 percent of all tax filers report wage income. Pensions and retirement accounts are an important source of capital income for the middle class. Pensions and annuities ($690 billion), Individual Retirement Account (IRA) distributions ($253 billion), and Social Security ($277 billion) combine to create $1.2 trillion in taxable retirement income. Business income is also a significant component of reported personal income. Some businesses, like S corporations, sole proprietorships, or partnerships, file their taxes through the individual tax code, accounting for $1 trillion in personal income. 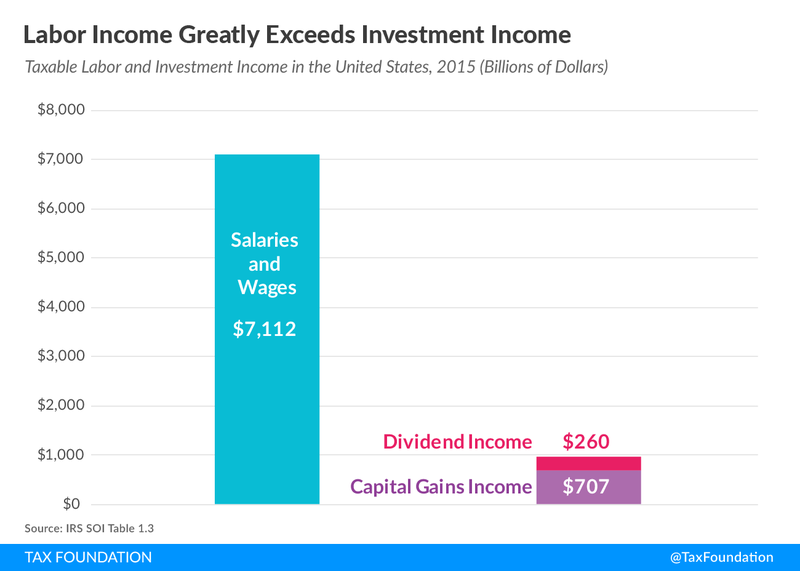 Capital gains and dividends accounted for about $967 billion in income in 2015, similar to income from business ($1 trillion) and retirement accounts ($1.2 trillion). The individual income tax is the federal government’s largest source of revenue. More than 150 million individual income tax returns were filed for tax year 2015,  and in each of these filings a household added up its income to report it to the Internal Revenue Service (IRS). The way the IRS individual income tax form (Form 1040) is structured, all sources of income are listed on the first page of the form, and added up to reach “total income.” After this, the tax return moves on to calculating how much each household owes in taxes and determining deductions and credits. This report divides income into four major categories—wages and salaries, business income, investment income, and retirement income—and reviews each of the four categories for tax year 2015. For most tax filers in the U.S., the largest number on the 1040 comes on line 7, the very first line pertaining to income. It is on this line that taxpayers mark wages, salaries, tips, and other compensation for their work. Most Americans get that number from their W-2 forms, supplied by their employers. In total, nearly 125 million tax filers in 2015 reported $7.1 trillion in wage income, or 6 8.6 percent of all total income. Most Americans report labor income, and most of their income comes from labor. This should not be a surprise; the U.S. is a nation of workers, and most of its economy is labor compensation. Any meaningful attempt to raise revenue through the income tax will almost necessarily include wages and salaries in the base, just by virtue of the math. One cannot raise much income tax revenue by excluding 69 percent of income. The amounts reported on the 1040 reflect most, but not all, labor compensation. Firms also pay for employee health benefits and make contributions to Social Security. Although neither of these is subject to the personal income tax, the IRS has a hand in both. The Patient Protection and Affordable Care Act will levy a “Cadillac Tax” on some health plans beginning in 2022, and the IRS administers the payroll tax through employer withholding. Taxpayers reported $260 billion of taxable dividends in 2015, and $707 billion of net capital gains, only some of which come from sale of corporate stock. Rhetoric about corporate income often exaggerates the impact of shareholder income on personal income and income inequality. Though the returns to corporate equity, as found on individual income tax returns, are substantial, they are much more modest than the rhetoric might imply. While these amounts certainly matter, they are substantially smaller than the $7.1 trillion of labor income described above. 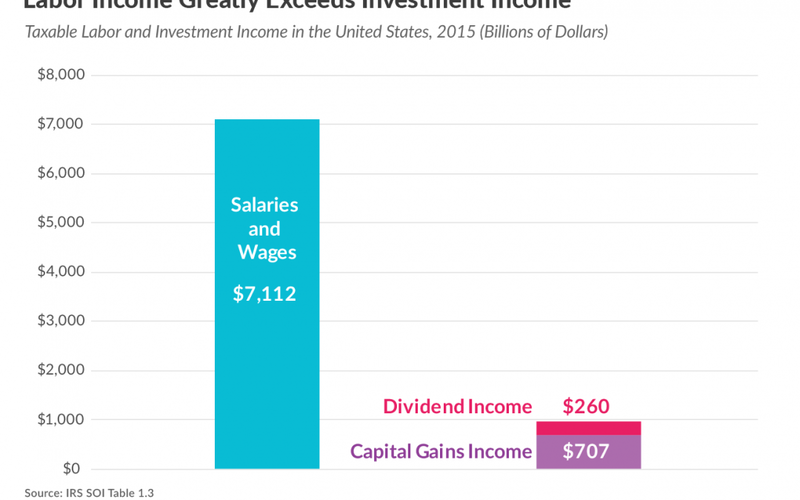 The amount reported in capital gains and dividends contradicts the notion that corporations use their revenues primarily to compensate owners and not workers. Rather, taxable labor compensation greatly exceeds taxable investment income (Figure 1). It also contradicts the notion that increasing taxes on investment income would have a substantial effect on the U.S. budget deficit; it is simply too small a portion of the economy. In 2015, taxpayers reported a total of $690 billion from pensions and annuities, and another $253 billion in taxable Individual Retirement Account (IRA) distributions. America’s system of retirement accounts, while overly complex, is taxed in a neutral way that removes the bias against saving. Notably, the income from retirement accounts is slightly above the capital gains and dividend income reported outside of retirement accounts. The CBO’s system of categorization was very defensible, but it can also leave a misleading impression. The report found that capital income—as defined on its terms—was very unevenly distributed; only the wealthiest Americans relied on it as a substantial source of income. It is important to remember this definition, though, and not conflate two ideas. The first idea—that middle-class Americans don’t report many dividends or capital gains on their 1040s—is true. A second idea that would appear to follow logically—that middle-class Americans don’t earn substantial returns to capital—is false. Middle-class Americans wisely put their capital in retirement accounts—where it enjoys proper tax treatment—instead of keeping the money out of retirement accounts and subjecting it to poor tax treatment. 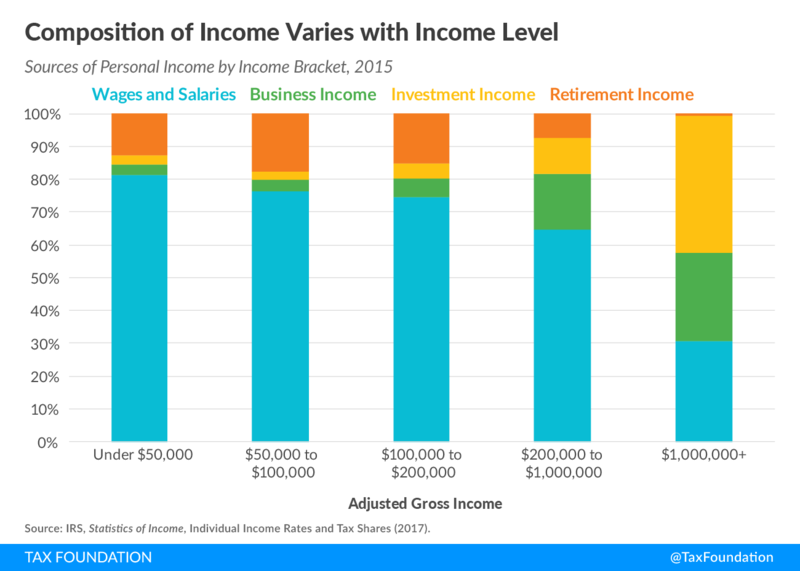 A look at the sources of personal income by income bracket shows the importance of retirement income to the middle class (Figure 2). Retirement income is most important as a source of personal income for taxpayers reporting between $50,000 and $100,000 of income, making up about 17 percent. In practice, of course, this means that a minority of middle-class taxpayers—the retirees—rely on this income quite a bit, while the majority, those of working-age, do not. Retirement income is difficult to account for, and the tax rules governing retirement accounts are not readily obvious to people unfamiliar with tax data. While pensions aren’t critical to every analysis of personal income, it is worth remembering a few things: pension income is, in economic terms, mostly a kind of capital income; it is about as important as any other kind of capital income; and it is most important to middle-class workers due to its employer-based structure. Walking through sources of personal income reveals many things about our tax code and our economy in general. Our personal income tax is largely a tax on labor, primarily because our personal income largely comes from labor. However, varied sources of capital income are in the mix as well. While these sources, even when combined, are small compared to labor income, they are still significant and need to be accounted for well, both by policymakers trying to draw in revenue efficiently, and by economists or journalists attempting to understand the distribution of personal income. Source: IRS, Table A. 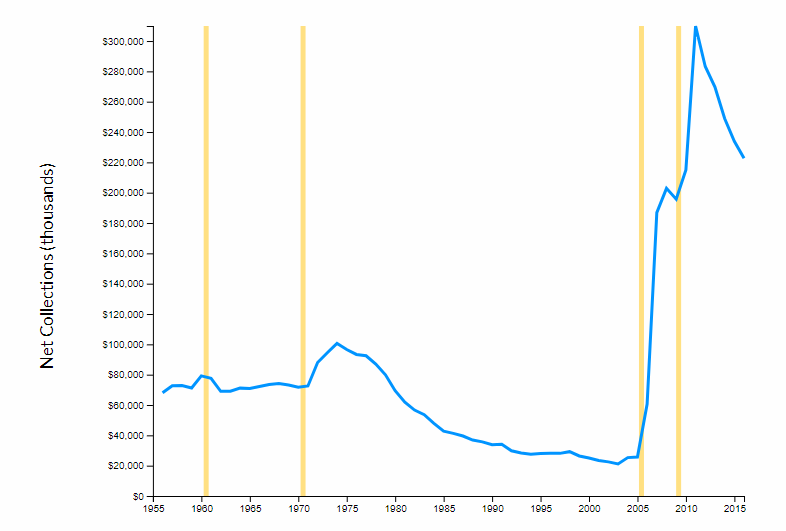 Selected Income and Tax Items for Tax Years, 1990-2015, in Current Dollars. Note: Capital Gains includes net capital gain less loss and capital gain distributions reported on Form 1040. Internal Revenue Service, “SOI Tax Stats – Individual Income Tax Returns Publication 1304 (Complete Report),” Table 1.3, https://www.irs.gov/statistics/soi-tax-stats-individual-income-tax-returns-publication-1304-complete-report. There are limitations on using data from the 1040 to understand the nature of income in the U.S. economy. Not all economic activity finds its way to personal income tax forms—particularly, employer-provided health insurance and returns to owner-occupied housing. Both are substantial components of economic output that do not appear on income tax returns. As broad economic aggregates, though, the categories of income established on the 1040 are still useful and instructive. Tax-free interest, such as interest on municipal bonds, adds another $62 billion. U.S. Census Bureau, “County Business Patterns (CBP),” https://www.census.gov/programs-surveys/cbp.html, and Census Bureau, “ Nonemployer Statistics (NES),” https://www.census.gov/programs-surveys/nonemployer-statistics.html. Kyle Pomerleau, “An Overview of Pass-through Businesses in the United States,” Tax Foundation, January 21, 2015, https://taxfoundation.org/overview-pass-through-businesses-united-states. Congressional Budget Office, “Trends in the Distribution of Household Income between 1979 and 2007,” October 25, 2011, http://www.cbo.gov/sites/default/files/10-25-HouseholdIncome_0.pdf. 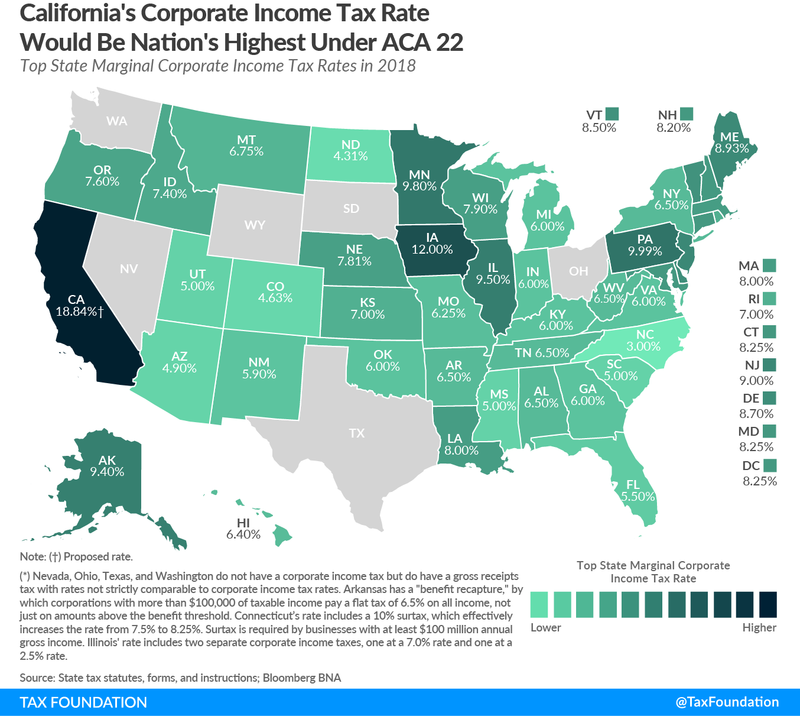 A constitutional amendment (ACA-22) pending before the California General Assembly would more than double the state’s corporate income tax rate, yielding the nation’s highest rate–an astonishing 18.84 percent, up from the current rate of 8.84 percent. Assemblyman Kevin McCarty (D), one of the lead sponsors of the amendment, characterized it as “middle class tax justice” and argued that given federal rate reductions, corporations could afford to pay more in California taxes. A lot more, evidently: the new top marginal corporate rate in California, imposed on all business income above $1 million, would be 90 percent of the federal rate of 21 percent. 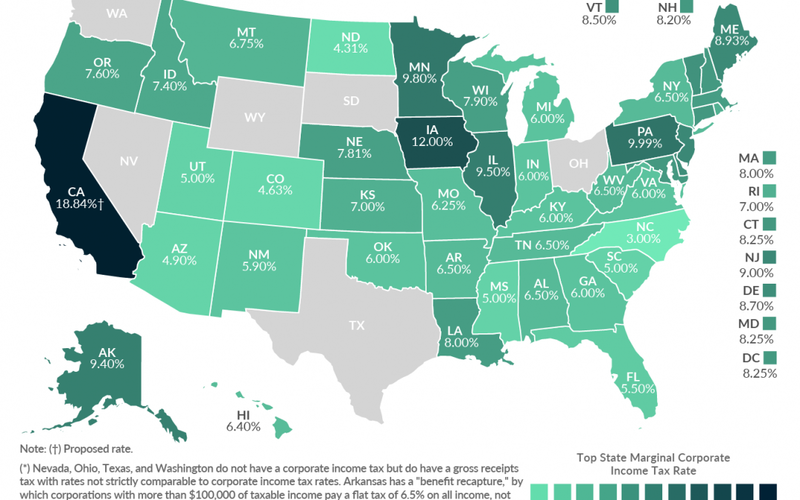 Nationally, the average top marginal corporate income tax rate is currently 6.5 percent, and the median is 6.3 percent. The proposed California rate would be three times the current median rate. Only one rate currently hits double digits, and that’s Iowa’s 12 percent corporate rate, which is partly ameliorated by a deduction worth 50 percent of federal taxes paid. Once that is taken into account, the highest rate is Pennsylvania’s 9.99 percent—and again, California is contemplating a rate of 18.84 percent. The recent federal rate reduction, from 35 to 21 percent, brings the U.S. corporate income tax rate in line with the average rate among developed nations. The lower rate not only makes the U.S. a more attractive destination for corporate investment, but also expands the overall scope of investment opportunities, since lower costs (including tax costs) mean that a greater number of projects will be viable. This is true, and it’s largely because of the state’s heavy taxes on corporations and high earners. Corporate income taxes are particularly volatile. Even in a recession, most people will still earn wages and still engage in consumption, so individual income tax and sales tax collections can only drop so far, but many businesses may post net losses and thus have no corporate tax liability whatsoever. Under ACA 22, California would double down on one of its most volatile revenue streams in an attempt to increase collections by $17 billion a year. How significant is that? If collections in other states held constant, California’s new corporate income tax collections would account for more than a quarter of the total of state corporate income tax revenues nationwide. California has a lot of business activity, but not that much. And if California’s corporate tax burden nearly tripled (from about $10 billion to $27 billion a year), it stands to reason that there would be a lot less business activity to tax. “[I]t is a tin-eared attempt by McCarty, D-Sacramento, and [cosponsor Phil] Ting, D-San Francisco, to resist President Donald Trump and congressional Republicans who approved a massive federal tax cut for corporations. It’s especially ill-timed when Gov. Jerry Brown anticipates sufficient tax revenue to maintain a $13.5 billion reserve fund this year. On Feb. 15, the Tax Foundation hosted an event on excise tax policy across the 50 states. We heard from experts with differing perspectives on excise taxes, including Reid Wilson, national correspondent from The Hill; Todd Nesbit, professor of economics at Ball State University; and Richard Auxier, research associate at Tax Policy Center. Our discussion touched on many different industry-specific taxes including cigarette taxes, alcohol taxes, marijuana taxes, and even taxes on sugar-sweetened beverages. Professor Nesbit kicked off the event with some stories from his new book, For Your Own Good, of how excise taxes can have unintended consequences. Plastic bag taxes, for example, actually result in greater carbon emissions as consumers switch to paper products that carry a bigger carbon footprint. Wilson noted that “sin” taxes have grown significantly even in just the last decade from their traditional application to alcohol and cigarettes to new applications to soda, plastic bags, marijuana, or opioids. Auxier went over principles that should be considered when an excise tax is proposed. Defining goals and then assessing the achievement of those goals is central to better policy in this area. The event was live-streamed on Facebook Live, but if you missed the opportunity to follow along with us, the video is available here below.